At Christmas time, it is such an enjoyable thing to make contact with people you have not seen, or spoken to for ages. Memories of time spent together, with people who are still friends, flood back into the heart, and yet, God has arranged things in such a way, that, regrettably, it is impossible to spend time with these people any more; time has ‘moved on’, life has ‘moved on’, people have ‘moved on’. All of we individuals lead our lives at a pace which suits us, our needs, our personalities; we all have a different pace of personal life, and that, in itself, is neither a positive nor a negative. That’s the way it is in our temporal – our secular lives – if you like! But, in the terms of Christian life, all that counts is the ‘Love’ that we build into our lives, whether they are busy, or ones that are more ‘laid back’ – I think today’s young would use the word ‘cool’. Under God’s ordnance, every life, each and every one of billions, past, present and future, is unique in its entirety. Take, for instance, our Saint Thérèse of Lisieux. She lived a life that was obscure and ‘lost’ in an enclosed Carmelite monastery of nuns. Yet, she is better known than almost all of her contemporaries, who were ‘dashing about’ from ‘pillar to post’, ‘fulfilling’ their vocations as teachers, business men or women, mums and dads, priests or whatever! But, just why is she so well known – and loved? The answer, I think, is because she lived, as best she could, the ‘ideal’ that God had put before her, and that included doing ‘with love’ every little task that God asked of her, within that obscure life. She wrote her biography ‘The Story of a Soul’, only because she was asked to write it – not for spurious recognition, or vain glory. Thus, Saint Thérèse is not only better known than most of her contemporaries – she also has a continuing influence so many, many years after her death, over one hundred years ago, because of her writings. 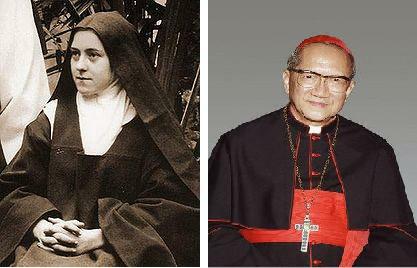 Another contemporary ‘hero’ of mine is the Vietnamese Cardinal, Francis Xavier Nguyen Van Thuan, who died just eight years ago. During his life, he spent 14 years in a Communist prison – on the ‘face’ of it, totally inactive – yet those years led to the production of a beautiful book, ‘The Road of Hope’, consisting, essentially, of one thousand little thoughts, ‘smuggled’ out of his prison, to encourage the Catholic faithful in Vietnam, who were being deprived of their beloved pastor. He, too, is still a massive influence on people today. Just to quote one of these sayings, (No. 487); “You must discover that you can – and indeed have the duty – to sanctify yourselves in and through marriage” – a most helpful thought, as we approach the family feast of Christmas. Shopping for Christmas Cards – or any kind of shopping, for that matter – is not something that occupies much of my attention. I have some lovely cards, purchased from our Piety Shop, and these I am sending, with joy, to many of my friends. On the receiving ‘end’, however, our postman delivered one the other day, addressed to me, and one specially chosen for its suitability, I am sure! 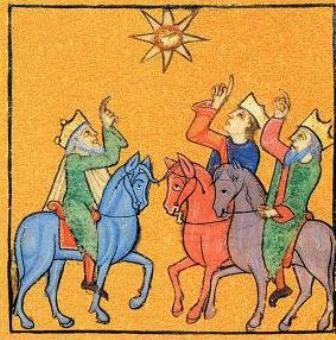 It pleases me to publish the card in this blog; from a twelfth century illuminated Psalter in the British Museum, it shows the three wise men – on their horses – as typical ‘English nobility’, of that period. All three are pointing up to the ‘Star of Wonder’ they had been following. Now, that illustration must have been done by an unknown, 12th Century monk, and I can picture him in my mind, working diligently away in a cold monastic cell, with great love and joy, his ‘purpose to fulfil’. Study his work and you will get the feeling that those ‘Three Wise Men’ are joyful, and expectant, because they have the ‘Star’ to follow – something of great importance giving direction to their lives. I dwell on all this and, in my heart, know that we need that ‘Star’, the ‘Star’ pointing to the all-embracing ‘Love’ that God has for each one of us. I also know that we, all of us, are invited to follow – doing God’s will – in our own way, and with ‘Love’, whatever our circumstances. As we follow, we, too, will feel the same joy and even excitement in our hearts – led by Love – responding to Love. as well as a divine mystery. disclosing its mystery to people in ecstasy. the continuity of life through fatherhood. because it is grafted into God. For me the word ‘ecstasy’ (poem para.2 above) refers to those who are able to go beyond – to transcend – their own worries, pre-occupations or self-centredness, and let the Mystery of the Divine enter their hearts in wondering contemplation. Unless you are ‘outside’ yourself, that will not be possible; take a ‘step back’, and have a good look at yourself, and you will see what I mean. As we journey onward towards Christmas 2010, may we share something of this joy – this pure delight in God. Christmas cards are not all ‘hum-bug’ as ‘Scrooge’ would have it – they can have a positive and quite wonderful effect – on senders and receivers!